From the creators of Warhawk comes a bold new 3rd Person shooter adventure where you can change the battlefield instantly in the heat of combat. In the future, humanity's last hope lies in the lawless frontier of space where factions battle over the universe's most precious resource, Rift Energy. Caught in the middle is Emmett Graves, an outcast gunslinger who is drawn back to the planet that abandoned him, to face a fierce outlaw and his warband of followers. Experience intense frenetic combat on foot, in vehicles, or in the air and discover a new type of shooter gameplay with the new “Build & Battle” system. Gain the tactical advantage by calling upon an arsenal of weapons, vehicles, and fortifications, violently delivered from an orbiting drop ship to help turn the tide of battle. Engage in epic 32 player online battles and see maps dynamically change depending completely on each player's strategy or team up with friends and protect your claim against waves of AI opponents in online and offline Co-op modes. The wait is finally over... Welcome to the Starhawk Public Beta! Check out the new video to find out all of the unbelievable action the beta has in store for you! 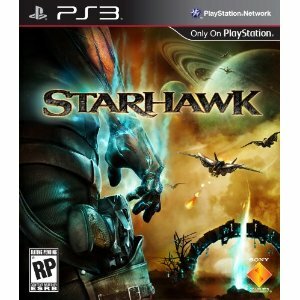 Starhawk will be on store shelves May 8th. What do you think, Jimmy? Are you buying this? Have you played the beta? Let us know! Starhawk™ Public Multiplayer BETA - bold new 3rd Person shooter adventure where you can change the battlefield instantly in the heat of combat during epic 32-player online battles!